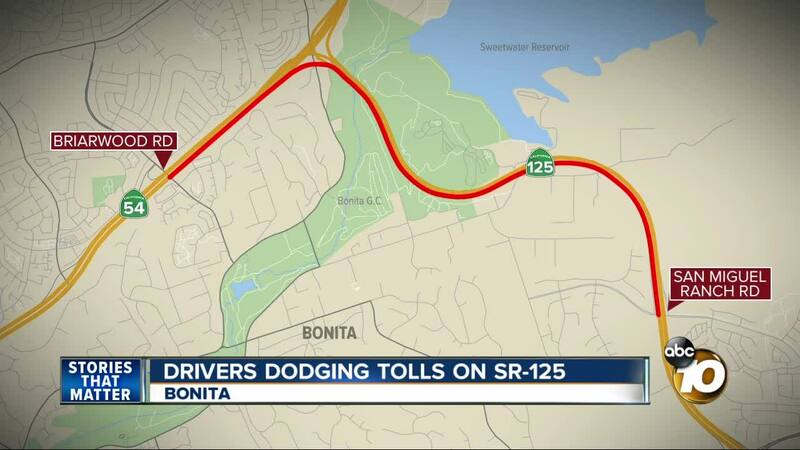 BONITA (KGTV) -- Neighbors in Bonita say their street is becoming congested with "toll dodgers" - drivers who are going out of their way to avoid paying the $1.55 toll on State Route 125 . It's not just the traffic buildup that neighbors find concerning, it's that these drivers are often speeding - right past an elementary school, parks and horse tracks. In a community meeting Tuesday, the City shared plans to fix the issues on Briarwood and San Miguel Ranch roads. "There's a lot of concern about people trying to evade the tolls," said Greg Cox, with the San Diego County Board of Supervisors. As a result, Cox said the City lowered the speed limit on San Miguel Road to 25 mph and placed a stop sign at a popular horse crossing. They also plan to intall a traffic signal at Sunnyside Elementary School. "If the County can secure a grant for the funding, that could be done within the next year," Cox said. John Scott has been in the neighborhood since the mid 1980s. He's noticed the buildup up of traffic over time, and says...he can't fault the drivers for trying to save a buck. "They got as much right to use the road as anybody else has to use the road," he said.